The meaning of Sukh Asana (Easy pose) is to be comfortable. In this asana we just sit cross legged comfortably on the ground. This is the easiest sitting pose, hence the name. 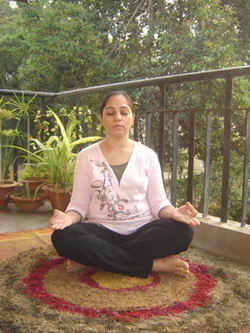 For pranayama and meditation, you need to sit in any meditation pose namely vajrasana or padmasana. This is the ideal sitting pose for beginners who cannot sit for long time in padmasana or vajrasana. Remember these yoga tips before starting yoga asanas. Sit comfortably on a yoga mat or a carpet. Bend both knees and sit cross legged. Waist, back and neck should be in a straight line. Keep your hands on your knees in gyana mudra (Fix the index finger with tip of thumb keeping other three fingers straight). This asana can be used for Pranayama or meditation. You can sit as long as you are comfortable. Duration of this asana can be gradually increased up to say 15 or 30 minutes. For beginners, you can use a yoga meditation cushion to support your bottom. This will help you to sit straight and for more duration. Whenever you have spare time at home, practice sitting in this asana instead of sitting on a chair or sofa. Waist and lower region of the waist become flexible. Ideal for doing meditation, prayers or pranayama for weak people. With sufficient practice you can sit for hours in this asana.